The last remaining church in the Soba Aradi district in the south east of the Sudanese capital, Khartoum, was demolished on 7 May. Security personnel, including riot police and National Intelligence and Security Service (NISS) officers, descended on the Sudan Church of Christ (SCOC) Soba Aradi premises without prior warning at around 2pm on 7 May and demolished the sanctuary, two offices and a centre used for Sunday school. The SCOC Soba Arabi was one of 27 churches fighting a joint case against a government decision to confiscate and demolish their buildings. The Administrative Court recently decided to dismiss the case, but the presiding judge had not delivered his written decision to the parties, preventing the lawyers for the targeted churches from submitting an appeal. As the demolition was underway, church members living close to the church rushed to the scene but were prevented from taking photos or filming. They were also ordered to unlock parts of the building to assist the demolition process. After refusing to comply with these orders, two men, Boulus Salih and Nagi Abdallah, were detained by NISS officers and interrogated for two hours. They were released after being forced to sign a document stating that they would not take photos of the demolished building. Local sources informed Christian Solidarity Worldwide (CSW) that the church had been meeting at the site since 1989, and that prior to South Sudan’s secession in 2011, Soba Aradi district had 13 churches representing diverse denominations. Twelve churches have been demolished since 2011, ostensibly under a government planning and re-development programme. Following the demolition of the sole remaining church building in Soba Aradi, church members held a prayer service next to the wrecked building. Given the government policy of not issuing permits for the construction of new church buildings, the congregation will not be able to repair or replace the building. The SCOC denomination is a predominantly Nuban church, and experiences both religious and ethnic discrimination. In the last year, two of its most senior leaders, Reverend Kuwa Shamal, head of the missions committee, and the vice-moderator Reverend Hassan Abdulraheem, were tried for national security crimes. In January, Reverend Shamal was cleared of all charges; however, following a questionable verdict, Reverend Abdulraheem is currently in a maximum security prison serving a 12-year sentence for espionage and two related crimes. The targeting of church buildings in Sudan is of growing concern. 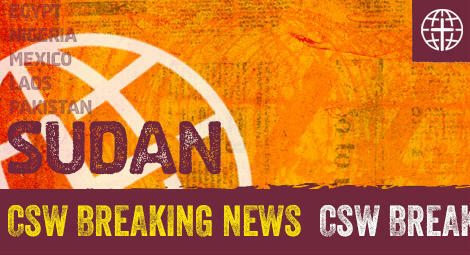 On 3 April, an elder of the Sudan Evangelical Presbyterian Church (SEPC) in Omdurman was killed at the Evangelical School in Omdurman while peacefully protesting against the unauthorised sale of church land. Three weeks later, a mob supported by police officers broke into the SEPC church building in Omdurman and ransacked the guard’s living quarters. Police later arrested the guard’s wife and three young children.